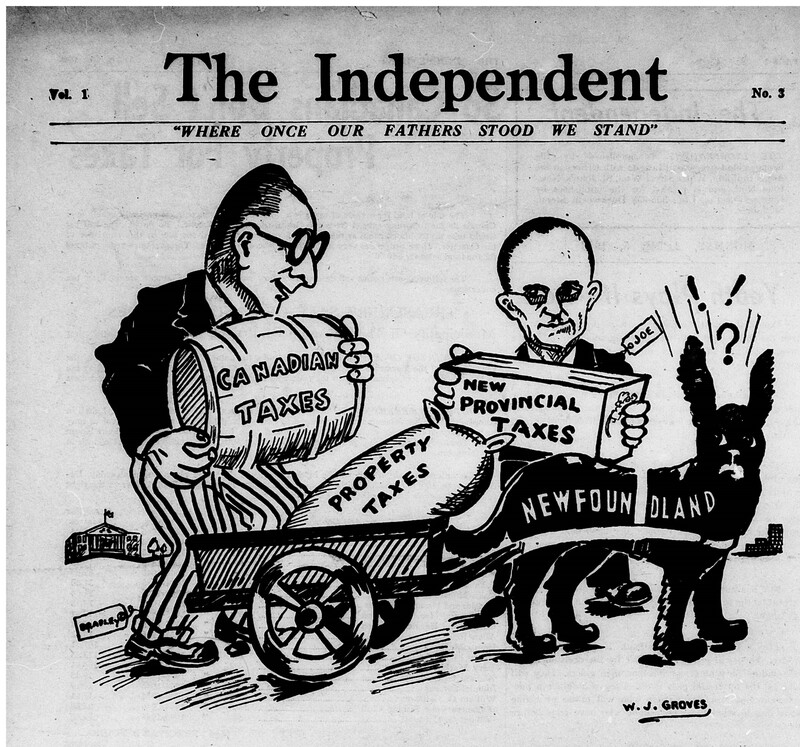 Newfoundland’s 1948 Referendum: A People’s Victory? July 23, 2018 July 12, 2018 No Comments on Newfoundland’s 1948 Referendum: A People’s Victory? The Responsible Government League attempted to scare the electorate in the referendum campaigns by emphasizing how Confederation with Canada would result in the imposition of a wide range of taxes. The Independent, April 5, 1948. Referendums are blunt instrument to measure public sentiments. They take complex issues and reduce them to simple yes or no answers. They allow charismatic politicians to seize the public stage and rally voters for or against a particular public policy option through the greater use of fear, distorted realities, and appeals to emotion than is generally normal during regular elections. Yet, there has been a resurgence recently in the use of referendums, and the consequences have been considerable. [i] In 2016, for instance, British voters opted to have their country leave the European Union and Colombians rejected a peace deal to end 52 years of war with Farc guerrillas. We often regret the choices citizens make in referendums and conclude that if they were as wise as we, then they would have voted differently. Do voters really know what they are voting on in referendums? Although the date of the first referendum was announced only on 11 March 1948, voters in Newfoundland and Labrador had known since December 1945 that the referendum was coming. On 11 December 1945 British Prime Minister Clement Attlee, who had visited Newfoundland several years earlier, had announced an election for delegates to a national convention to consider the country’s economic conditions and make recommendations as to which constitutional options should then appear on a ballot in a national referendum. It was the beginning of a long campaign that started with the opening of the National Convention on 11 September 1946 and whose debates were recorded and broadcast each evening to an eager and receptive audience throughout the country. The evidence is not conclusive that citizens exhibit greater knowledge of ballot issues when campaigns are intense and longer, but it does suggest that citizen competence and knowledge about ballot issues is greater if citizens acquire throughout the campaign a feeling of entitlement and a sense that their vote can make a difference. Throughout the Convention debates, some of the delegates, especially Smallwood, directed their speeches not to the members of the Convention but to the VONF radio audience, constantly reminding listeners that they held the power in their vote to decide Newfoundland’s and their own future. In the referendum campaigns that followed, voters were constantly reminded of the power they exercised in their ballot. before 1933 with poverty and economic deprivation. The Confederate, June 23, 1948. Of course referendum campaigns are binary and polarizing in nature, but Newfoundlanders in 1948 had ample opportunity to fully understand the options on which they were voting. Despite allegations, then and since, that the Confederate side bribed voters with a promise of Canada’s ‘baby bonus’, that the British Government fixed the outcome, and that the people just didn’t know what was happening, voters in Newfoundland and Labrador were, indeed, knowledgeable and competent about the ballot question. The members of the Newfoundland Ranger Force, for instance, reported from their posts throughout the country that the debates in the National Convention generated considerable interest throughout the country, especially once the battle lines were drawn between Confederates and anti-Confederates. Moreover, some 88 and 84 percent of eligible voters cast ballots in the referendums on 3 June and 22 July, respectively. The deciding factor in the referendum was social citizenship not bribery, emotion and incompetent voters. 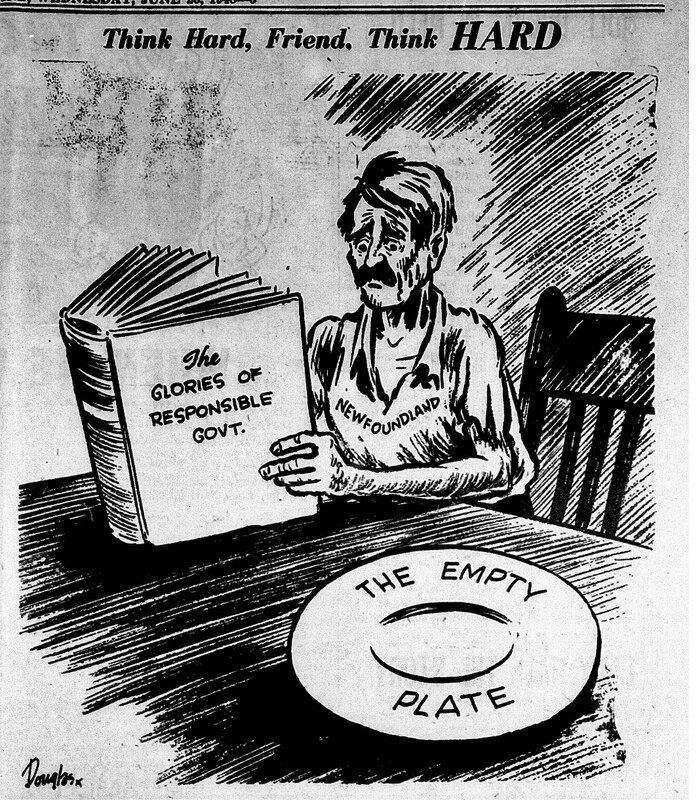 Newfoundland had rarely been a prosperous country and the Great Depression had hit particularly hard. Although it recovered during the Second World War, there was considerable fear among voters in the late 1940s of the economic future, a fear that the Confederates exploited. Moreover, the Confederates promised in union with Canada a new relationship between state and citizen, a form of social citizenship which had won great acceptance in many nations after the war. Social citizenship was associated with social rights that came largely with the emergence of the welfare state (family allowances, old age pensions, unemployment insurance, and other benefits), but it also included the provision of public services such as electrification, health care, public education, and a host of others that many Newfoundlanders desperately sought. It included, in the words of T.H. Marshall “the whole range from the right to a modicum of economic welfare and security to the right to share to the fullest in social heritage and to live the life of a civilised being according to the standards prevailing in society.”[iii] The promise of a welfare state and the promotion of social citizenship especially appealed to mothers, and the Confederates better capitalized on winning the female vote than did those who campaigned for a return to responsible government. The RGL attempted to counter such rhetoric with an appeal to patriotism and notions of political citizenship that had been pivotal in Newfoundland’s rejection of Canada in 1869. However, in 1948, voters narrowly opted for union with Canada, which also, and incidentally, meant a return to responsible government and provincial autonomy. Some 70 years ago, on 22 July 1948, then, an informed and competent electorate went to the polls and a small majority cast their lot with Canada. Newfoundlanders were never fools in the process. Nor were they ill-informed, nor easily swayed by prejudice and hysteria, or by the emotional appeal of demagogues. The debates were followed closely and citizens made informed, though certainly personal and self-interested choices. Those who voted for union with Canada knew what they were voting for as did those who voted for a return to responsible government. If other citizens throughout North America and Europe, but especially in neighbouring Canada, enjoyed the benefits of social citizenship and a caring state, why shouldn’t they many asked? Union with Canada held the promise of a more secure standard of living than the one to which they had been accustomed as an independent country and voters found that option more attractive and compelling than the appeal to nationalism and patriotism that had worked well in the past for those who wished to chart an independent course for Newfoundland within the British Commonwealth. Voters narrowly chose Canada on 22 July 1948 because they decided it was their best option after carefully evaluating the choices they had on the referendum ballot. Raymond B. Blake teaches at the University of Regina and has written widely about Canadian political history. His new book (with Melvin Baker) exploring Newfoundland, Canada and Confederation since 1864 will be published in early 2019 by the University of Regina Press. [i] Lionel Marquis and Manfred Max Bergman, “Development and Consequences of Referendum Campaigns in Switzerland, 1981–1999,” Swiss Political Science Review 15(1) 2009: 63–97. [ii] On the history of Confederation in 1949, see Paul Bridle, ed., Documents on Relations Between Canada and Newfoundland, vol. 2, Confederation, Parts 1 and 2 (Ottawa: Minister of Supply and Services Canada, 1984); John FitzGerald, “‘The True Father of Confederation’? Archbishop E.P. Roche, Term 17, and Newfoundland’s Confederation with Canada” Newfoundland Studies, 14, 2 (1998), 188–219; J.K. Hiller and M.F. Harrington (eds. ), The Newfoundland National Convention, 1946–1948, vol. 1, Debates (Montreal: McGill-Queen’s University Press, 1995); David Mackenzie, Inside the Atlantic Triangle: Canada and the Entrance of Newfoundland into Confederation, 1939-1949 (Toronto: University of Toronto Press, 1986); Peter Neary, Newfoundland in the North Atlantic World, 1929-1949 (Montreal and Kingston: McGill-Queen’s University Press, 1988), Corey Slumkoski, Inventing Atlantic Canada. Regional & The Maritime Reaction to Newfoundland’s Entry into Confederation (Toronto: University of Toronto Press, 2011); Jeff A. Webb, “Confederation, Conspiracy and Choice: A Discussion” Newfoundland Studies 14, 2 (1998), 169-87. [iii] T.H. Marshall, Class, Citizenship and Social Development (New York: Doubleday, 1964), 72.